For other places with the same name, see City of Rocks National Reserve. City of Rocks State Park is a state park of New Mexico, United States, consisting of large sculptured rock formations in the shape of pinnacles or boulders rising as high as 40 feet (12 m). The City of Rocks was created 34.9 million years ago by a volcanic eruption. Then over millions of years, erosion sculpted the rock formations seen today. The eruption was from the Emory Caldera, centered near Hillsboro Peak at the southern end of the Black Range. The eruption was estimated to be a VEI 8.5 eruption. Also related to the eruption was the 314-square-mile (810 km2) Kneeling Nun Tuff. The Mimbreno Indians settled in the area about 750 - 1250 AD. Pottery, arrowheads, and other artifacts show evidence of prehistoric Indians in the area. Indian wells, or conical holes, are found in the rocks where water would be allowed to collect. Chapter 110 of the 1953 Laws of New Mexico created City of Rocks State Park on March 20, 1953. This legislation provided for the lease of 640 acres (2.6 km2) of land from the Commissioner of Public Lands, New Mexico State Land Office for the purpose of a State Park and recreation area. City of Rocks State Park provides opportunities for walks, hiking, camping, rock climbing, picnicking, wildlife viewing, and dark night-sky viewing (including a 14-inch (36 cm) telescope). Other features of the park include hiking trails, picnic areas and a desert botanical garden. The visitor center includes a large display area, books, maps, and information. The park is open all year. Nearby are the communities of Silver City and Deming. Facilities include electrical and water hookups for camping, with restrooms and hot showers. At least 50,000 people visit the park annually. ^ Breining, Greg (2007). "Most-Super Volcanoes". Super Volcano: The Ticking Time Bomb Beneath Yellowstone National Park. St. Paul, MN: Voyageur Press. p. 256 pg. ISBN 978-0-7603-2925-2. ^ "City of Rock State Park Management Plan" (PDF). New Mexico, Energy, Minerals and Natural Resources Department. Retrieved 24 September 2010. 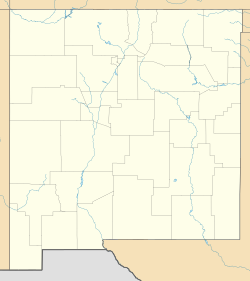 Wikimedia Commons has media related to City of Rocks, New Mexico. This page was last edited on 12 November 2018, at 01:51 (UTC).